Law offices have a reputation for being a workplace where employees have an enormous workload to manage. You’re probably dealing with that problem right now. With this constant challenge, legal professionals are often searching for ways to lighten the workload by streamlining their tasks and more effectively managing their productivity. That’s where legal document management systems can be a big help. While you may know of the benefits this type of software provides, your boss might not, so it will be up to you to convince them if you want to see the law firm adopt it. Getting their purchase approval is not always easy to do, however. Check out these tips on how to talk to your boss in order to get law document management software into your own office soon. No doubt you have a bunch of ideas and improvements you’d like to see implemented in your law firm. Seeking ways to make your office better is a good thing, but when talking to your boss, you don’t want to overwhelm them with a whole list of improvements and changes you want. Your boss is likely willing to listen to an idea you have but not a dozen ideas in one sitting. Approach them with just the one idea of implementing a document management system. That will keep your conversation focused and increases the chances of getting a response either right in the moment or soon after. Bringing up improvements means solving problems, and bosses love having problem solvers on the team. But when you talk to your boss about changes, while you’ll obviously need to bring up the problems you hope to solve, you’ll want to spend most of your time talking about the solution. If all you do is talk about problems your law firm is experiencing, you can easily come across as a complainer, and that’s something bosses don’t want to deal with. Emphasize the solution of legal document management software. Talk about the benefits of mobile DMS, the advantages of advanced search features, and how much the law firm can gain from workflow automation. Do this and you’ll place a positive spin on your conversation. Your boss’s time is valuable. If you manage to get them one-on-one, you’re going to have to make the most of it. That’s why you need to be direct and to the point. You don’t have to waste time on small talk, just bring up the issue and how you’d like to fix it. Getting rid of the fluff can turn a thirty minute conversation into a ten minute one. If you show your boss how much you value their time, they may be more likely to agree with your opinion. After all, adopting legal document management software is all about saving time. You can go to your boss, mention a problem, and emphasize the solutions to that problem all you want and it still might not convince them. Some bosses are simply facts and figures people who mainly see the bottom line, even in the legal profession. When you bring up legal document management systems, you’ll need to stress the great ROI it provides. 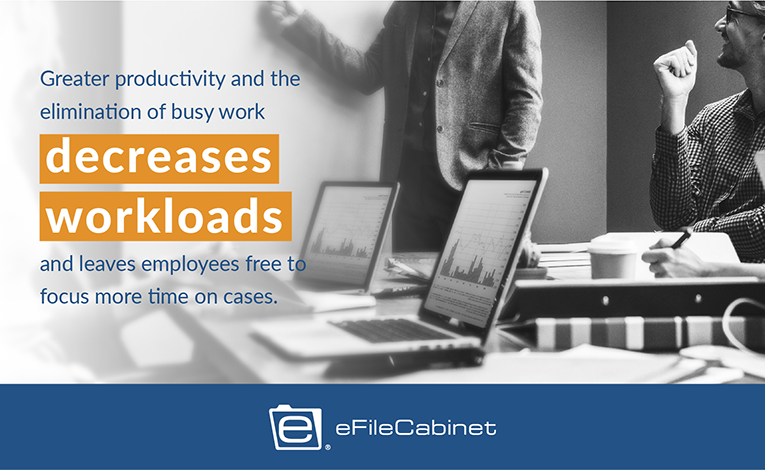 Greater productivity and the elimination of busy work decreases workloads and leaves employees free to focus more time on cases. So while it’s important to talk about advanced document searching along with audit trail and compliance standards, don’t forget to show how much this software helps increase the law firm’s profits by cutting costs and improve work quality. As important as it is to tell your boss your idea, communication is a two-way street. Your boss may have some concerns, or they may ask important questions. If you ignore or dismiss what they say, then you’re only setting yourself up to be ignored as well. Respond appropriately to their questions, even repeating them if necessary to make sure you understand. By practicing good communication techniques, you’ll be able to have a dialogue with your boss. This will help to iron out any discomfort the boss may have with your idea and ensure you get legal document management software implemented as quickly as possible. While it may feel intimidating to speak to the one in charge, the benefits of using document management systems should be enticing enough to give it a shot. Now that you know how to talk to your boss, you’ll feel more confident approaching them and getting the response that will make your job easier. If you need more information that will help you become better prepared for speaking to your boss, be sure to download this ebook: Streamline Your Workflow and Improve Your Firm’s Efficiency.